If you’re going to make pumpkin doughnuts, you may as well go all out with these pumpkin doughnuts filled with pumpkin custard and topped with maple bacon frosting! When pressed, I consider myself a child of both the 80s and 90s. I spent my first 8 years in the 80s, but really did some key growing up in the 90s. And by that, I really mean that I was introduced to the New Kids on the Block at an extremely young age and then transitioned effortlessly into the Backstreet Boys craze. I can truly define my finest milestones by the pop music that was playing in the background. Or the musicians whose images were decorating my field hockey stick. Clearly I was a very serious athlete in that I would print photos of celebrities off the internet (grainy photos, I might add), cut them out, and laminate them to my field hockey stick. Everyone from the Backstreet boys (Brian all the way), Sugar Ray’s Mark McGrath, and Ricky Martin (I was in serious denial… and am pretty sure I still am). What I’m really trying to say is “oops I did it again.” With these doughnuts. And after all is said and done, I think it’s safe to say Britney Spears defined the high school years. It’s almost like I grew up with her; but she chose a scary head-shaving path, while I stayed in school and only used an umbrella when it rained. But when you’re on a field hockey team in the late 90s, it only makes sense for you to pretend to be Britney Spears and perform her songs at any and every spirit event. You already have the plaid skirt after all. And… and… well, I guess the plaid skirt is all you really need. I still remember way too much of our 10th grade dance to “Crazy.” I’m not sure why things like that stick around in my brain when I still can’t remember my husband’s phone number. Really. I’m not proud, but it’s one of the side effects of being a child of the 90s. Also? 10 Things I Hate About You? The best. I believe “oops I did it again” will be one of my generation’s catchphrases for whenever we make a mistake. But usually a mistake that’s not really a mistake and was actually done on purpose. Like “oooops. My bad.” Like these doughnuts. Trust me, I want to use my doughnut pan. I really do. But whenever I get it out for a baking project, I realize how much I really want doughnuts. Like real doughnuts. Like what’s the point in making baked doughnuts when they’re never as good as real doughnuts. So, I just keeping doing it. I’ll say oops. But I won’t apologize. This recipe seems like a lot of steps. And I won’t lie, it’s not a super quick and easy recipe. But it’s honestly not very difficult and I think that after you make fried doughnuts just once, you’ll realize you’re pretty good at it. And to me, making doughnuts is quite therapeutic. It has something to do with the rising process. And these pumpkin doughnuts go through two stages of rising. The first right after you make the dough. And the second, after you form your doughnuts. To me, there’s just something so magical about dough rising. It also means you’re doing something right! They look kind of like homemade hamburger buns. 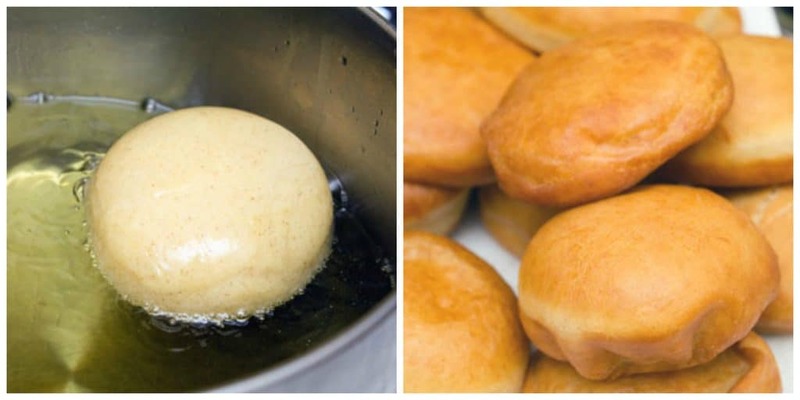 A lot of people don’t love frying in their home and I admit that it’s not my absolute favorite thing either, but for these doughnuts, it is so worth it! You need to be patient and wait until the temperature of the oil hits 350 degrees. I could give you my spiel about how frying doughnuts really isn’t that bad if you have your oil at 350 degrees because the oil doesn’t actually seep into the doughnut, but I’ll refrain. I’ll just say, you can see how quickly these cook and how un-greasy they are when they’re done. Once they’re all fried up, let the doughnuts cool so you can fill and frost them! I guess cooking and baking really is like therapy to me because making this pumpkin custard also felt quite therapeutic. 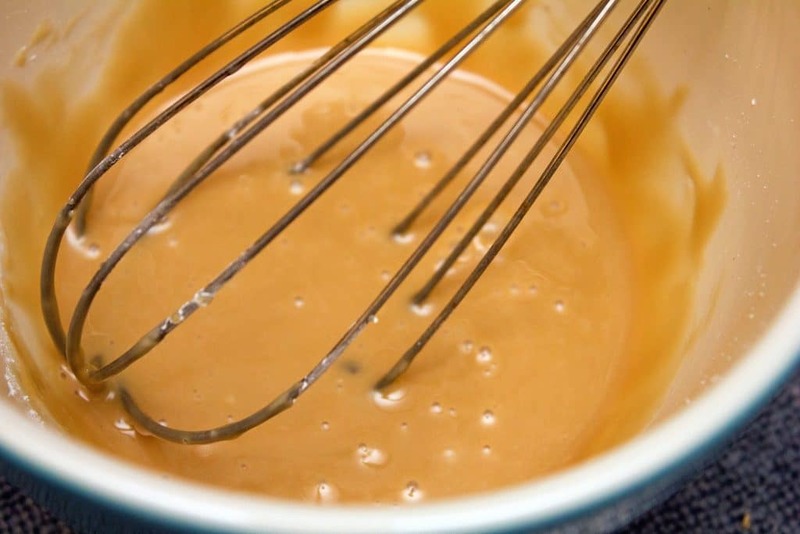 Custard is also scary to many people, but this one is pretty easy as long as you follow all the steps and make sure you temper the egg mixture. This custard has pumpkin puree and pumpkin pie spice in it and it will make your kitchen smell amazing! And now we’re ready for the frosting! OK, this is technically maple frosting, but my recipe calls for sprinkling bacon over the top of the frosting after you drizzle it on the doughnuts. 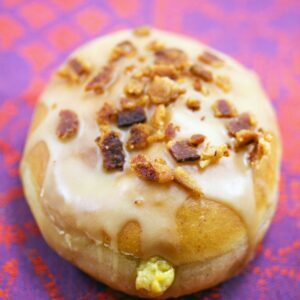 I obviously put bacon on top of my doughnuts, mainly because I’ve never had the chance to go to Voodoo Doughnuts in Portland and I drool over their bacon maple doughnuts whenever I see photos of them . Of course, you don’t have to add bacon to yours. Some might even say the bacon on these is just overkill. And, in a way, I agree. But I didn’t let that stop me. 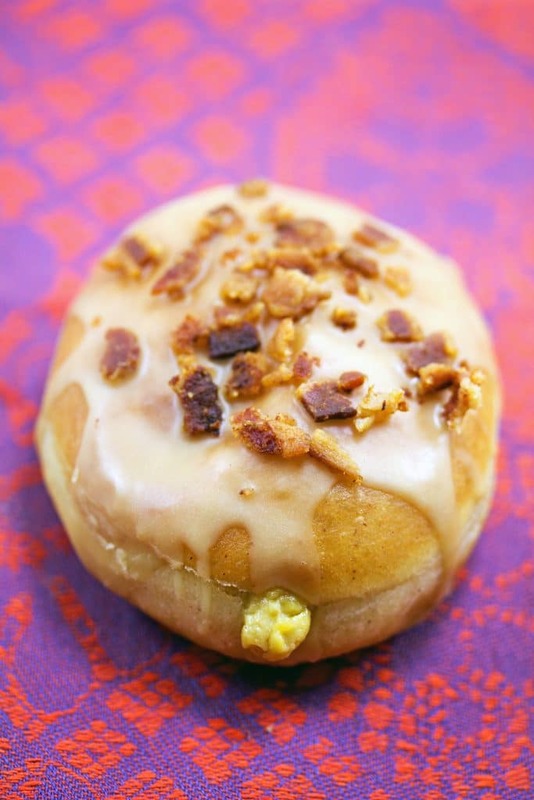 Because maple bacon is one of the most wonderful combinations in the world. Once the doughnuts have cooled, you’re ready to fill and frost! I spooned the pumpkin custard into a pastry bag, inserted tip into the doughnut and squeezed in the custard. Then I drizzled a fair amount of maple frosting over them and crumbled some bacon on top. And my Pumpkin Doughnuts with Maple Bacon Frosting were complete. Holy moly. Nothing better than this. Who knows when/if I’ll ever get to Portland’s Voodoo doughnuts. But I guess it’s not so important now. after all, the only thing that could make a bacon maple doughnut better is adding in a big pumpkin kick. I thoroughly enjoyed every aspect of this doughnut and really think you could do so much with each of the separate elements (i.e. using the pumpkin custard in other desserts, putting the maple bacon frosting on everything, etc.). I loved that the doughnuts had a little pumpkin pie spice in them, but not enough to really overwhelm. The custard inside the doughnuts is key. It has a nice creamy pumpkin-y flavor and really gave the doughnut another delicious layer. And that maple bacon frosting on top most definitely ties everything together. It has a super sweet, fall-like quality to it, topped with the perfect amount of saltiness. Each bite of these pumpkin doughnuts was like heaven and I’m pretty sure I closed my eyes the entire time I was eating it. With lots of “mmms” thrown in, of course. This is most definitely a once-a-season treat, but one that’s very well-worth it. And one that I’m going to have to seriously restrain myself against making again this season. So, yes. Oops I did it again. But it was so, so worth it. My doughnut pan remains sitting abandoned, but I think it will get over it. I’m pretty sure even my doughnut pan was jealous of these babies. Just like Britney, I’m really not sorry I made these pumpkin doughnuts. Then again, do you think Britney could even make doughnuts? Do you think she spends any time in the kitchen at all? And furthermore, do you think she gets as obsessed with pumpkin season as the rest of us? These are the questions I ask myself. Fall officially starts next week, but I’m claiming these are totally acceptable right now. What’s the best doughnut you’ve ever had? If you’re looking for more delicious doughnut recipes, check out these Grapefruit Doughnuts and these Glazed Coffee Frosted Chocolate Doughnuts. If you're going to make pumpkin doughnuts, you may as well go all out with these pumpkin doughnuts filled with pumpkin custard and topped with maple bacon frosting! In a small bowl, dissolve yeast into warm water. Stir gently and then let rest for about 5 minutes, until mixture gets frothy. In the bowl of your mixer (or in a large bowl with a hand mixer), whisk together flour, pumpkin pie spice, and salt. stir in sugar. 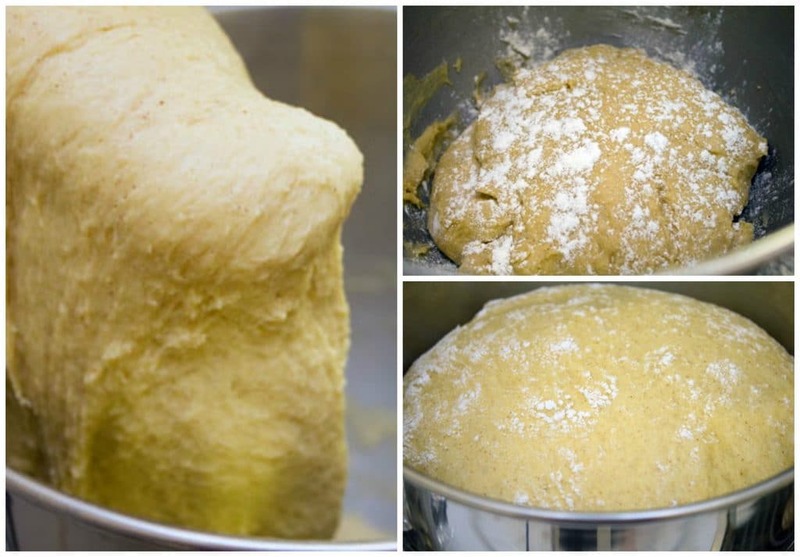 Add milk, butter, egg yolks, and yeast mixture and blend together using the mixer’s dough hook (if you don’t have a mixer with dough hook, a hand mixer is fine). Once dough forms, increase speed to medium-high and beat for about 3 minutes. Sprinkle dough with flour, cover with a kitchen towel, and put in a warm spot to rise. Let dough rise for about 2 hours. Lightly flour a surface and place dough on it. Roll dough out into a square, about 1/2-inch thick. 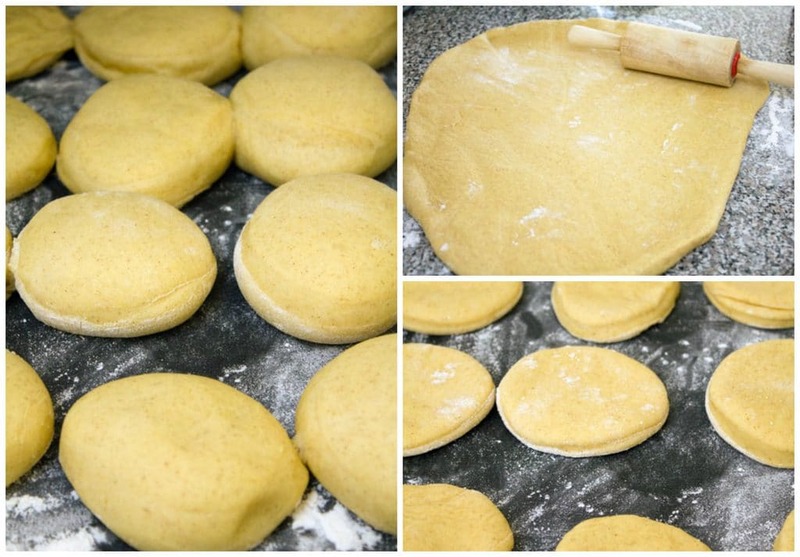 Using a biscuit cutter or the top of a drinking glass, cut out as many rounds as possible (with a 3-inch biscuit cutter, you should get about 14 doughnuts). Place rounds on a lightly floured baking sheet and cover with a kitchen towel, put in a warm spot, and let rise for about 30 minutes. In a large stockpot, heat about 2.5 inches of canola oil to 350 degrees. Put doughnuts in hot oil, 2-3 at a time.. Let fry for about a minute and then flip over to fry on the other side for another minute, until golden on both sides. Remove doughnuts to paper towel covered plate. Repeat until all doughnuts are fried. Let doughnuts cool slightly. When doughnuts have cooled a bit, spoon pumpkin custard in a pastry bag fitted with a wide tip. Insert tip into doughnut and squeeze custard into doughnuts. 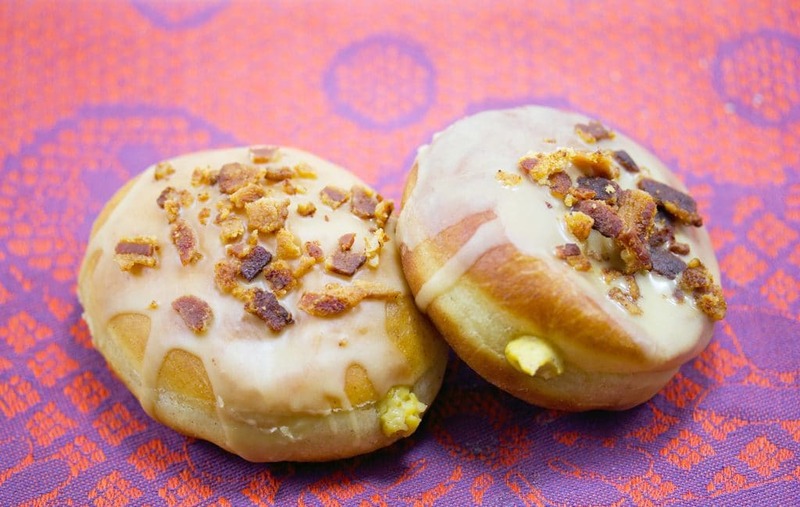 Drizzle maple frosting over doughnuts and sprinkle crumbled bacon over the tops. In a heat-proof large bowl, whisk together egg yolks and sugar. In a separate medium bowl, whisk together flour, cornstarch, and pumpkin pie spice, and whisk the dry ingredients into the sugar/egg mixture. Whisk until smooth. Mix in the pumpkin puree, too. In a large saucepan, bring the milk and vanilla to almost a boil. 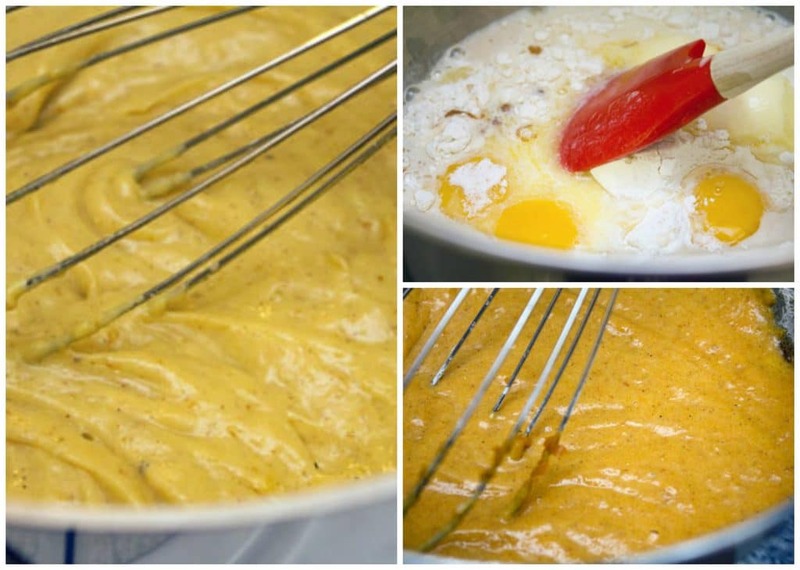 Remove from heat and slowly pour it into the egg mixture, whisking all the time to prevent curdling. Pour it all back into the saucepan and continuously whisk over medium heat until it thickens, about 5 minutes. Remove saucepan from heat and put custard into a separate bowl. Cover with plastic wrap so plastic is touching the top of the custard. Pop in the fridge to chill. In a medium bowl, whisk together milk and confectioners' sugar. Add in maple extract and whisk to combine. It should be a good consistency for drizzling. If frosting is too thick, add in more milk 1/2 tsp at a time. If it's too thin, add in more powdered sugar, 1 Tbsp at a time. 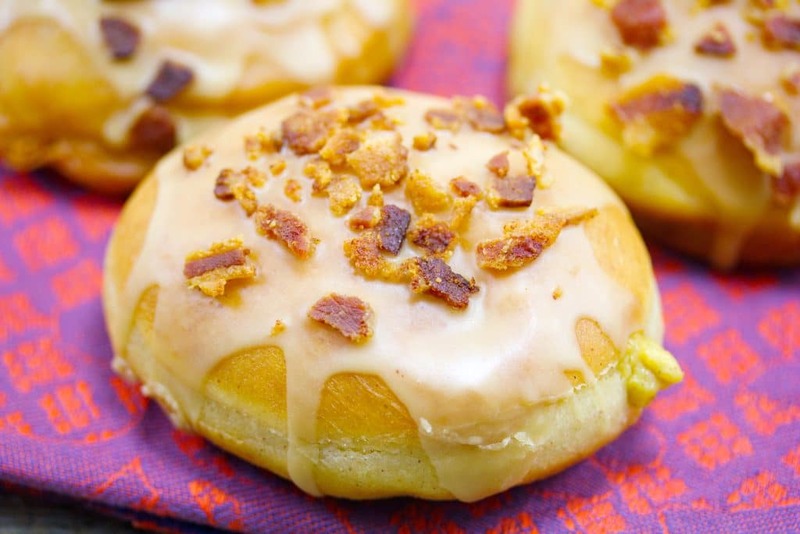 33 Responses to "Pumpkin Doughnuts with Maple Bacon Frosting"
First of all, these look amazing. Second, you need to watch the x-factor this season. It has me obsessed with britney spears all over again. I could definitely see these at Voodoo! Awesome creation =). These look outrageous in the best possible way!! These look amazing. I just went to Holy Donut in Portland, ME. They have some delicious combinations. Can you say sweet potato ginger or dark chocolate sea salt? I need to blog them asap since I went specifically for: bacon and cheddar stuffed doughnuts. I want these every day of my life. You are brilliant and these donuts look so incredibly delicious! I also long to make the journey to Voodoo Donuts and sorta flip out whenever I hear about them. Did you know they collaborated with Rogue Brewery to make a maple-bacon beer? I hear it’s on the sweet side, but still…I’m intrigued. These look amazing! I don’t think I would eat them myself but I know tons of people who would. And I’m dying to try Voodoo Donuts. I would go to Portland just to try their famous donuts! These are some seriously amazing doughnuts! Wow! These look amazing! I love the maple bacon combo, and with the pumpkin in there as well?? I die. I want one of these right now! I don’t even eat bacon…but I’d eat these. Oh my GOD. Time intensive but so worth the wait I’m sure! Wow…yes, yes…I definitely need some…they look incredibly delicious. Do you have any leftovers? I think I may try my hand at these next week for all my work friends…they would go crazy over them!! My boss will probably even give me the day off! just from your blog through Hungry Housewife. OH MY GOD! These look delicious!!! I had something similar from a donut food truck – awe.some! These look wonderful!! Oh, these are gorgeous!! I have never tasted anything like this before and I can’t wait to give them a try. Double yum and what a super idea to top these gems with bacon! Kudos to you for a super fall recipe. 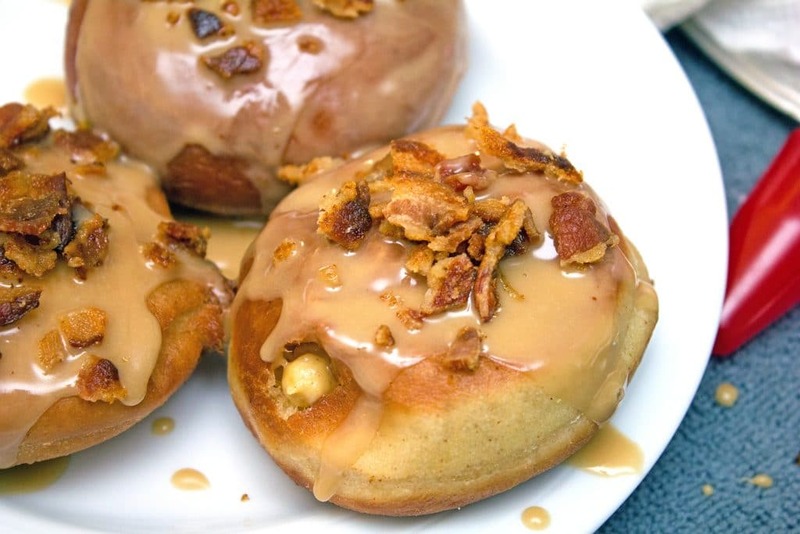 I just made donuts with bacon crumbles but now I need to make these PUMPKIN donuts… YUM! I agree… if you’re going to make doughnuts, ya gotta fry them. And it doesn’t hurt to fry up some bacon too. Love these. Bring on fall! Oh wow! These look so good. Sure beats bacon bits too! No apologies necessary! As soon as I saw the title every fiber of my being started craving them! Heaven. What a delicious combination of ingredients, Sues! OMG.. if I had one of those right now, it would make my entire week!!! YUM!!!! I just died and went to autumn heaven. Summer who? My mouth is watering – these look amazing! And so perfect for a fall brunch! you just made me laugh out loud! These are going to bring world peace . I’m going to drizzle with maple syrup.